Ungavaite: Mineral information, data and localities. 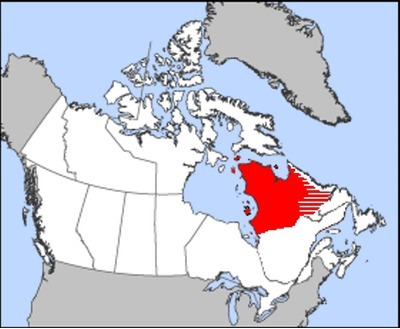 To recall the region in which it was discovered, Ugava region, in what is now northern Québec, Canada. The administrative region was an entity from 1895 to 1920, though it effectively ceased operation in 1912. The Pd-dominant analogue of genkinite. Possibly the Sb analogue of 'UM1984-07-As:Pd'. Also compare 'UM1978-21-Sb:Pd'. Holotype Natural History Museum, Cromwell Road, London, SW7 5BD, UK (polished section #BM 2004, 34), and the Canadian Museum of Nature, Ottawa (polished section; #CNMMN 84397). In a narrow (Pd+Sb)-rich zone separating massive and disseminated sulfides. McDonald, A.M., Cabri, L.J., Stanley, C.J., Rudashevsky, N.S., Poirier, G., Mungall, J.E., Ross, K.C., Durham, B.R., Rudashevsky, V.N. (2005) Ungavaite, Pd4Sb3, a new intermetallic mineral species from the Mesamax Northwest deposit, Ungava region, Québec, Canada: Description and genetic implications. CAnadian Mineralogist: 43: 1735-1744. McDonald et al (2005), Canadian Mineralogist: 43: 1735-1744. Smith and Barnes (2011) Table 4.